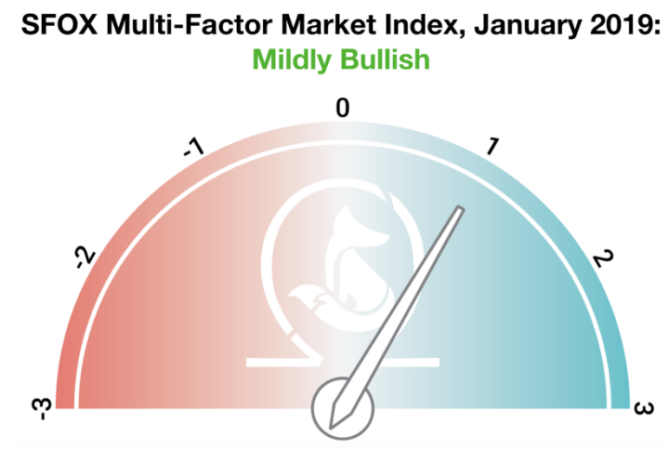 The SFOX Multi-Factor Market Index has swung from moderately bearish entering 2019 to moderately bullish entering February. The index is a proprietary model that looks at quantifiable market factors such as volatility, market sentiment/news coverage, adoption, etc. BTC, ETH, BCH, and LTC all experienced steady declines in their 30-day historical volatility over the course of last month, and were all more volatile than the S&P 500 and gold. Specifically for BCH, the report cites a reduction in volatility post-hash war as a sign that the market has digested the conflict between BCH and BSV. Looking into February, the broker sees CBOE and CME futures expiration dates (Feb. 13 and 22, respectively) and the Ethereum Constantinople hard fork around Feb. 27 as events that could drive volatility indices during the coming month.